I'm going to be honest here, I got this Outward Hound Daypack for Sisci so I could put my phone it it and let her hatch Pokemon eggs in it for me.It has the all-important strap between the front legs to prevent it from rotating around her body, plus a handle on top and a second strap further back to help lift her over obstacles. With expandable pockets and a breathable harness, what's not to love? This comes in three sizes for dogs 15-32" around the chest. 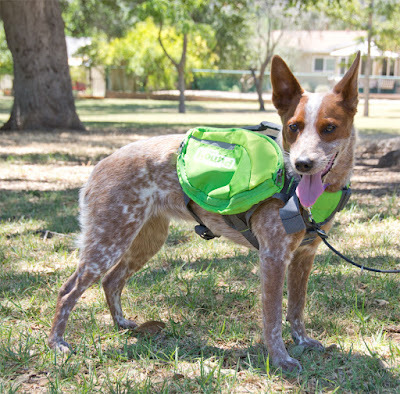 The small Outward Hound daypack is listed as fitting dogs up to 30 lbs and 20" around the chest, while the medium fits dogs over 30 lbs and greater than 20" around. Sisci weighs 28 lbs and measures 22" around the chest so I bought the medium. Admittedly, I bought this because my Ruffwear Palisades pack is in storage, and I wanted a dog backpack quick and cheap. Unfortunately, Outward Hound exceeded my expectation of low-quality and sent me something so flimsy I'm surprised it survived being adjusted and tried on for fit. The straps are made out of very coarse and loose nylon webbing. This construction pretty much guarantees that the weave is going to warp, run, or tear as soon as they catch one of those big loose threads on anything. I ended up pulling a big unsightly loop out of one just catching it slightly with the velcro used to keep the strap ends from flapping. Adjusting the daypack wasn't easy, It's not really made to fit my dog. I had to make the neck strap as tight as possible to keep it from sliding down onto her shoulders. This made it very bulky with nowhere to tuck the loose end. Even though Sisci is at the very bottom of the measurement for this pack, the strap between her front legs wasn't long enough. With the neck and front chest piece sitting in the proper place, this center strap pulled the one behind her legs into her armpits. I am absolutely certain that the lump bumpy straps would have chafed her horribly had I left it on. Cons: Very poor material quality. Lack of durability, there are lots of reports of the pack ripping in various places with minimal use. Looks uncomfortable for wearing for extended periods. Bottom Line: I put this on Sisci and she refused to walk. She has been endlessly patient with me dressing her in all sorts of silly things, so I took that as a sign. Flimsy, cheap construction and my dog hates it? Returned. Isn't it brilliant? I didn't come up with it, but wanted to share. Outward Hound definitely needs to find a better balance, I get that they're a value brand and stuff should be affordable, but it should also be usable.